If you are interested in a workshop for your community, feel free to contact Lehua Kinilau-Cano, HHL Legislative Analyst at [email protected] or (808) 620-9486. 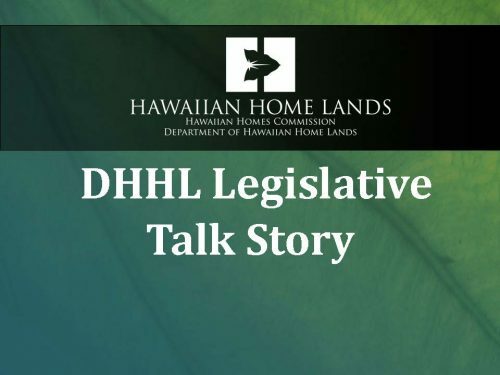 Below is a copy of the presentation given at the DHHL Legislative Talk Story Sessions. Click here for a PDF version of the presentation. Given the fast pace of the legislative session, updates will be posted at DHHL’s website at dhhl.hawaii.gov/legislation or via social media. Additionally, webinars or conference calls twice a month during the legislative session are being planned to begin in early February.